Sometimes there's just too much good stuff. At Zara on 34th Street I try to limit myself to 5-10 minutes of grabbing from one side of the store. 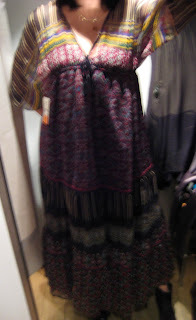 Following is torturous amounts of pics, all product from the front left-hand side of the store. Imagine if I grabbed for 15 minutes? Major props to my dressing room attendant. 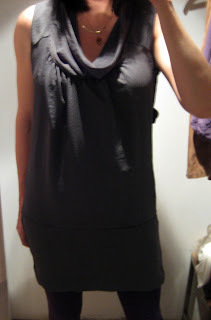 I wanted to add this grey jumpsuit (which photographs purple) to favorites, but the zipper is broken. Ahem. 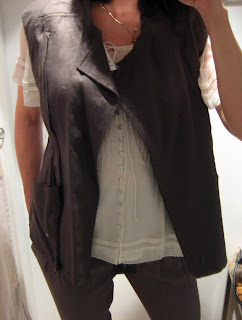 I love this suede jacket w/uneven hem, cute open or shut. But the ribbon tie downgrades it, I'd prefer a leather thong. These are hanging on a sales rack. 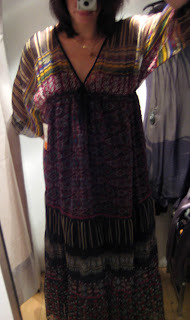 All I can say is summer, humidity, hippie love, and wear this to a festival and twirl around in mud. It's a bargain. Probably the best and tightest faux snakeskin pants I've ever worn. And yes, I used to shop Contempo Casuals. So pretty if they gave it to me I'd wear it with the tag on. 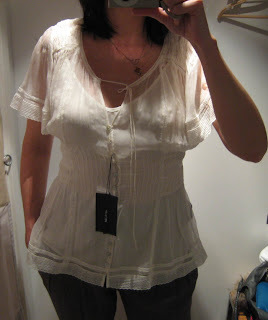 And Zara tops now fit me, woohoo! And uh-oh. You know thanks for reminding me why I always want to go in Zara because there is always so much purple!!!! I just wished I like everything a little bit more. That entire outfit with the suede jacket should've gone home with you. And MAN this post makes me wish Zara would get out to MN already. Gnar Jen - go, this is a tiny drop in the purple of ocean at Zara. 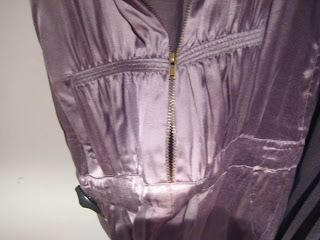 Sal - that suede jacket is even cuter in person, what a great piece. Can't believe Minneapolis doesn't have a Zara!! 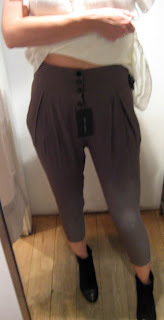 I kinda love those harem pants! I'm now on an OPERATION to track down those grey pants! 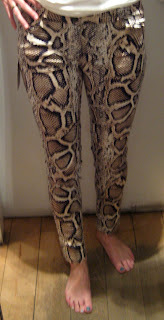 And the faux snake print trousers are so bad its good. Oh I love those pants and that dress!!!! THE SNAKESKIN PRINT PANTS ARE SO AMAZING. CAN YOU REMEMBER WHAT THEY COST? GAIA - I don't remember exactly, but I'm pretty sure they were in the low $100. $120ish?